Minidisk Neoangin uses this format, which is about to go extinct, for his backing tracks. 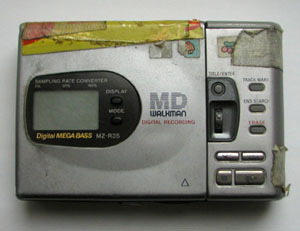 The rumor keeps going around that Neoangin will end his musical career the moment his MD player goes defunct. Mix tape For years and years Neoangin recorded radio shows, for example John Peel’s radio shows, and made mixed taped from them. These mixed tapes could be considered a sort of blueprint for the Neoanginian sound-imagery: for example, recorded on such a tape could be—sans interruption—a piece of lofipop, followed by a techno number, followed by a rocksteady number, and then followed by a folk song. Neoangin wants his records to sound like mixed tapes. Mailorder Neoangin personally packages, addresses and mails all orders. But since logistics don’t seem to be his forté, mistakes can happen. This shortcoming became particularly dramatic during the 2008 Christmas season. Jim attempted to package, address and mail 70 individual orders plus create the 70 individual drawings that were supposed to go with them, all in one day. In the end he had to pull several all-nighters to get the job done.